For other uses, see Tropics (disambiguation), Tropic (disambiguation), and Tropical (disambiguation). The tropics are a region of the Earth surrounding the equator. They are delimited in latitude by the Tropic of Cancer in the Northern Hemisphere at 23°26′13.5″ (or 23.43709°) N and the Tropic of Capricorn in the Southern Hemisphere at 23°26′13.5″ (or 23.43709°) S; these latitudes correspond to the axial tilt of the Earth. The tropics are also referred to as the tropical zone and the torrid zone (see geographical zone). 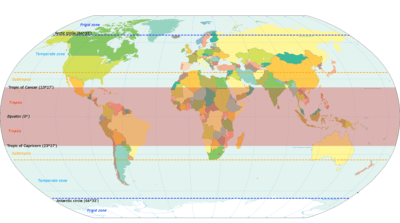 The tropics include all the areas on the Earth where the Sun is at a point directly overhead at least once during the solar year (which is a subsolar point). Many tropical areas have a dry and wet season. The wet season, rainy season or green season, is the time of year, ranging from one or more months, when most of the average annual rainfall in a region falls. Areas with wet seasons are disseminated across portions of the tropics and subtropics. Under the Köppen climate classification, for tropical climates, a wet season month is defined as a month where average precipitation is 60 millimetres (2.4 in) or more. Tropical rainforests technically do not have dry or wet seasons, since their rainfall is equally distributed through the year. 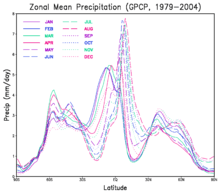 Some areas with pronounced rainy seasons see a break in rainfall during mid-season when the intertropical convergence zone or monsoon trough moves poleward of their location during the middle of the warm season. When the wet season occurs during the warm season, or summer, precipitation falls mainly during the late afternoon and early evening hours. The wet season is a time when air quality improves, freshwater quality improves and vegetation grows significantly, leading to crop yields late in the season. Floods cause rivers to overflow their banks, and some animals to retreat to higher ground. Soil nutrients diminish and erosion increases. The incidence of malaria increases in areas where the rainy season coincides with high temperatures. Animals have adaptation and survival strategies for the wetter regime. Unfortunately, the previous dry season leads to food shortages into the wet season, as the crops have yet to mature. Regions within the tropics may well not have a tropical climate. There are alpine tundra and snow-capped peaks, including Mauna Kea, Mount Kilimanjaro, and the Andes as far south as the northernmost parts of Chile and Argentina. Under the Köppen climate classification, much of the area within the geographical tropics is classed not as "tropical" but as "dry" (arid or semi-arid) including the Sahara Desert, the Atacama Desert and Australian Outback. 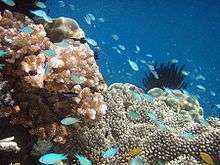 Tropical plants and animals are those species native to the tropics. Tropical ecosystems may consist of rainforests, dry deciduous forests, spiny forests, desert and other habitat types. There are often significant areas of biodiversity, and species endemism present, particularly in rainforests and dry deciduous forests. 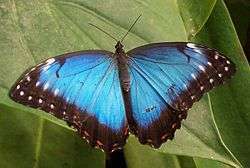 Some examples of important biodiversity and/or high endemism ecosystems are: El Yunque National Forest in Puerto Rico, Costa Rican and Nicaraguan rainforests, Amazon Rainforest territories of several South American countries, Madagascar dry deciduous forests, the Waterberg Biosphere of South Africa, and eastern Madagascar rainforests. Often the soils of tropical forests are low in nutrient content, making them quite vulnerable to slash-and-burn deforestation techniques, which are sometimes an element of shifting cultivation agricultural systems. Tropicality encompasses at least two contradictory imageries. One is that the tropics represent a Garden of Eden, a heaven on Earth; while the alternative is that the tropics are primitive and essentially lawless. The latter view was often discussed in Western literature—more so than the first. Western scholars also theorized about the reasons that tropical areas were deemed "inferior" to regions in the northern hemisphere. 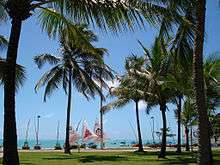 A popular explanation focused on the differences in climate—as tropical regions typically have much warmer weather than northern regions. This theme led some scholars, including Gourou, to argue that warmer climates correlate to primitive indigenous populations lacking control over nature, compared to northern populations having "mastered nature". ↑ Michael Pidwirny (2008). CHAPTER 9: Introduction to the Biosphere. PhysicalGeography.net. Retrieved on 2008-12-27. ↑ "Updated world Koppen-Geiger climate classification map" (PDF). ↑ Elisabeth M. Benders-Hyde (2003). World Climates. Blue Planet Biomes. Retrieved on 2008-12-27. ↑ J . S. 0guntoyinbo and F. 0. Akintola (1983). Rainstorm characteristics affecting water availability for agriculture. IAHS Publication Number 140. Retrieved on 2008-12-27.